If you’re planning a trip to Chicago, you’ll want to make the most of it. The tricky part is figuring out the must-see spots in Chicago, as there are so many exciting attractions to choose from. 48 hours isn’t nearly enough time—though that just means you’ll have to plan another trip shortly after! There are worse things, right? Besides, Chicago was just named the best city in the world. Here’s all you need to see, do, and eat for a well-rounded experience. The Art Institute of Chicago: If you’re looking for fantastic art exhibits and collections, the Art Institute of Chicago is the perfect place to visit. What’s more, there are even events and special learning opportunities for people of all ages. Be sure to check the calendar for updates. Architecture Tour: There’s no better way to see the city of Chicago and its finest architecture than taking a guided tour. When it’s nice out, take the Chicago Architecture Foundation River Cruise, which will give a tour by boat of more than 50 buildings along the Chicago River. Millennium Park: Millennium Park is a spot to visit year-round. In the wintertime, head to the McCormick Tribune Ice Rink and in the summer, take in an outdoor musical festival or dip your feet in the water spouting from the Crown Fountain. It’s a beautiful area right in the heart of downtown Chicago—and don’t forget to take a selfie with the Bean! Navy Pier: Looking for a fun afternoon? Head to Navy Pier, where there are special events and attractions for all ages. From the renowned Ferris wheel and games, to the dining and beer garden scene, there’s plenty to do. There’s even a Children’s Museum for young ones to enjoy. Local Performances: You can always see a Broadway show, but you’ll want to look deeper into local Chicago talent and performances. For instance, Chicago has Second City, as well as other comedy clubs, where you’re bound to get some good drinks and laughs. You can also see dance and other theatrical performances around—be sure to check out the happenings in Chicago’s diverse neighborhoods. 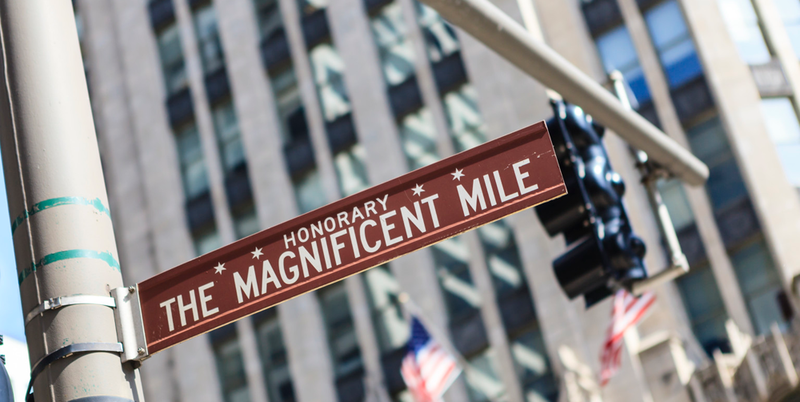 Shop Along Michigan Avenue: Get your walking shoes ready to browse the department and designer stores along Michigan Avenue. You can also head to Water Tower Place for its diverse food court and shops, although there are many other restaurants along the strip to satisfy your appetite after all that shopping. Garrett’s Popcorn: Chicago makes some delicious popcorn, and there’s a reason why the line outside of Garrett’s is always so long. It’s well worth the wait—between the Chicago signature mix, known as Garrett Mix, which blends caramel and cheddar, to something sweet for the season, there’s a flavor for every type of taste bud. Deep-Dish Pizza: You can’t go to Chicago without trying deep-dish pizza—it’s an experience like no other. Head to Giordano’s or Lou Malnati’s, or find a neighborhood joint that serves up a mean pizza pie. You’ll need a fork and knife for this one. Donuts: Chicago has a surplus of donut shops. Why? Because they do them right. Between Glazed and Infused, Firecakes, Do-Rite Donuts, and Stan’s, there are so many donut shops to choose from and all have equally delicious flavors. Plus, most recipes are really unique—you can’t find them in many cities.